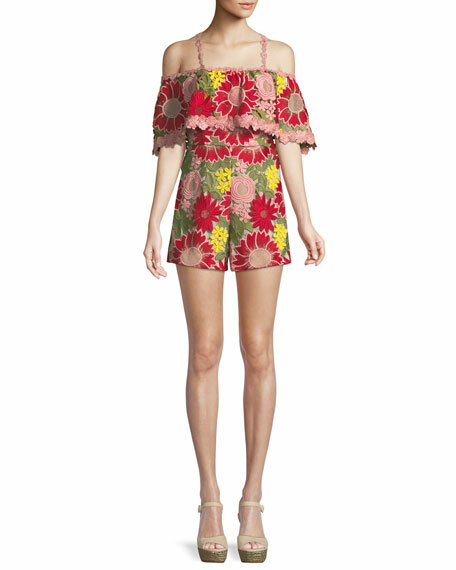 Alice + Olivia "Anelle" romper in colorful floral lace. Ruffled panel frames off-the-shoulder neckline. 3x1 romper in dark-wash denim. Square neckline; elasticized at back. Camisole straps. Self-tie belt. Side slip pockets. Relaxed fit. Step-in style. Cotton. Made in USA of imported materials. Model's measurements: Height 5'10"/177cm, bust 33"/84cm, waist 25.6"/65.2cm, hips 35.8"/91cm, dress size US 2-4/FR 34-36. 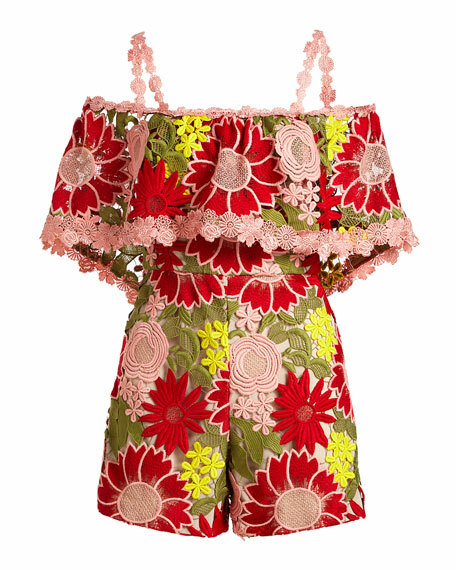 EXCLUSIVELY AT NEIMAN MARCUS Cosabella "Becca" teddy-style lounge/PJ romper in metallic knit. Scoop neckline; square back. Thin, adjustable shoulder straps. EXCLUSIVELY AT NEIMAN MARCUS Cosabella "Becca" teddy-style lounge/PJ romper in metallic knit. Scoop neckline; square back. Thin, adjustable shoulder straps. Drawstring waistband. Relaxed silhouette. Dolphin hem. Viscose/nylon/polyester/spandex. Modal/spandex trim. Hand wash. Made in Italy. Model's measurements: Height 5'10"/177cm, bust 33"/84cm, waist 25.6"/65.2cm, hips 35.8"/91cm, dress size US 2-4/FR 34-36. Isabel Marant "Derron" blazer in shimmery ribbed knit. Notched lapel; double breasted button front. Long slouchy sleeves. Belted hips. Side slip pockets. Straight fit through legs. Mid-thigh length. Viscose/silk/metallic fiber. Made in Poland.